The Skip Garden at Kings Cross is quite remarkable. 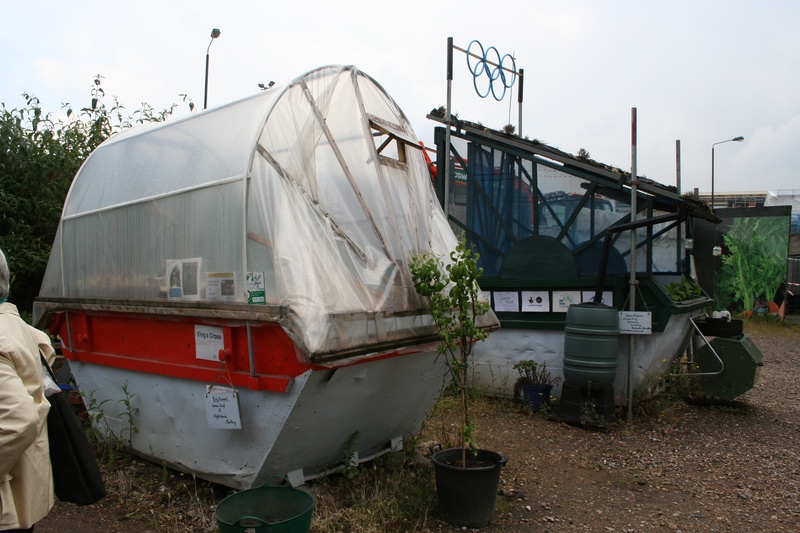 Paul Richens has created ‘portable permaculture’ in six skips on a small scrap of land on the edge of the King’s Cross redevelopment. 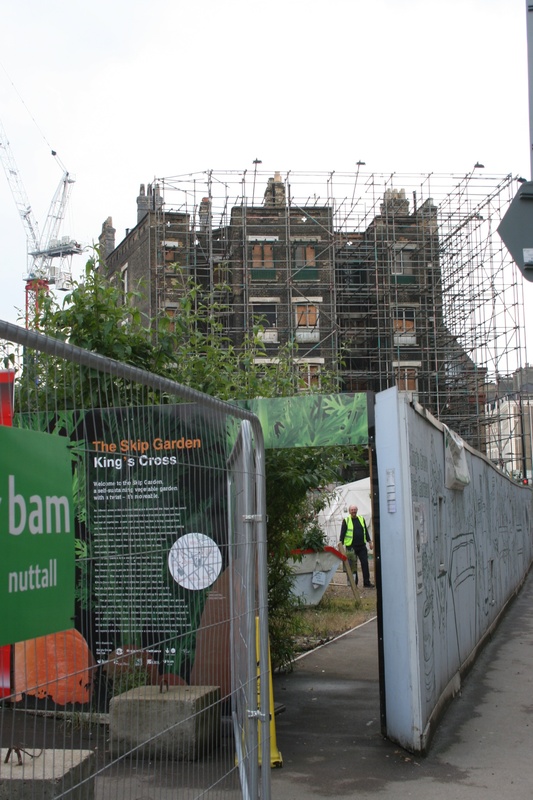 In a few months, the plot will become part of the building site, but thanks to the skips, the garden will continue uninterrupted elsewhere. 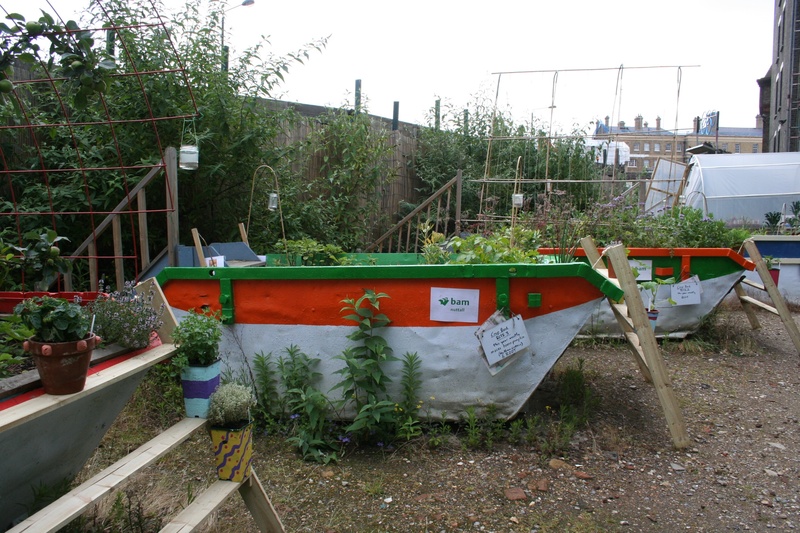 The main growing skips contain raised beds on three sides, accessible from the outside edge, or, by climbing the neat steps, standing in the middle of the skip, navel-high to the soil. The beds are about 60cm wide and 60cm deep, containing loam, compost and a final layer of deep wood-chip mulch to stop them drying out too quickly. Additional growing space is provided by lean-to shelving structures, where potted plants provide herbs and strawberries. 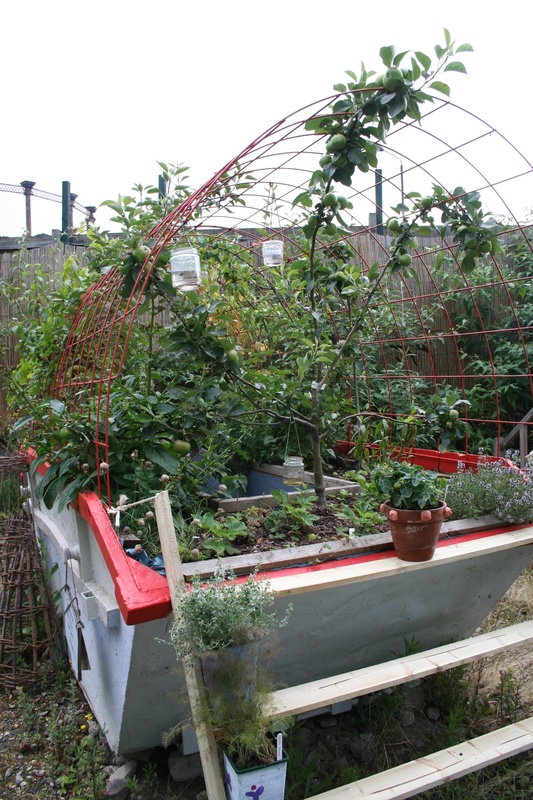 The first skip is dedicated to a mini- orchard and perennial bed, with an arched cage of concrete-reinforcing mesh providing support, and contains various healthy-looking fruit trees and bushes. Three skips are then dedicated to a standard organic rotation system: this is no temporary garden! Amongst the produce here, there is the beautiful red-flowering Broad Bean ‘Epicure’ along with sweetcorn, kale, potatoes, beet, onions, squashes, herbs… you name it, a skip’s got it! In one skip, green manure Phacelia tanacetifolia has been allowed to flower giving a bee-friendly display. The final two skips provide a poly-tunnel (also insulated on the inside, since all that steel gets cold), and a shaded wormery with a comfrey bed. 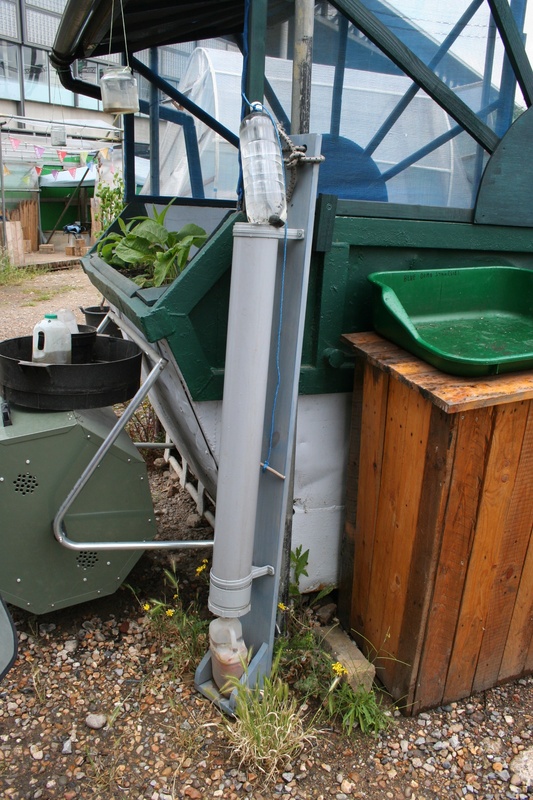 The wormery receives vegetable-derived waste from local restaurants, which forms the only material input to the site now it is up and running, and provides nutrient- and microbiologically rich vermicompost. Arguing on the ‘good’ side of the wormery “leachate vs tea” debate, Paul collects the wormery run-off and waters his plants with it regularly, with no ill effects, giving them a microbial boost that helps them obtain nutrients from the soil. A remarkably simple gadget adorns the wormery skip: a sort of comfrey tea hydraulic ram! Basically, it’s a big pipe, into which comfrey leaves are inserted, and then a neatly fitting 2 litre bottle of water provides pressure to squeeze the juice out of the leaves as they rot. A hole in the bottom of the pipe allows collection of the nutrient rich comfrey tea, without all the smelly buckets of water. A neat idea I’ll certainly be copying! 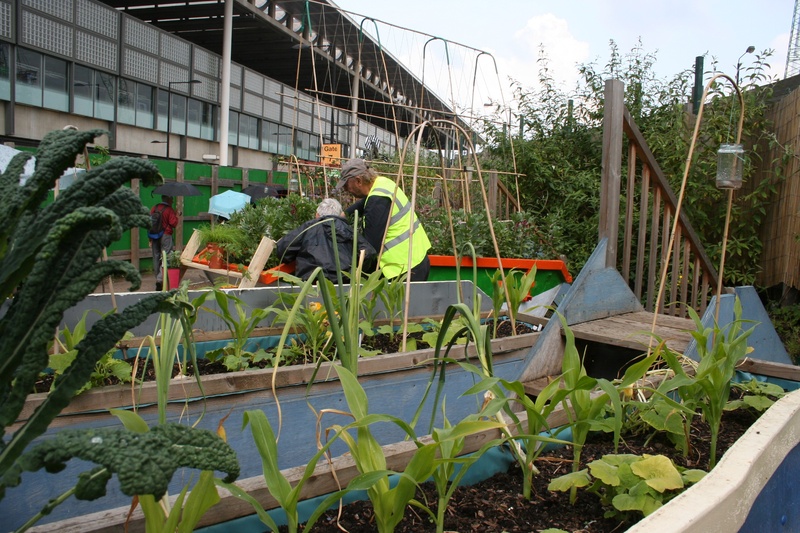 The Skip Garden is a remarkable achievement, and a truly imaginative solution to sustainable urban growing in an otherwise garden-unfriendly environment. Inspirational. This entry was posted in Organic Techniques, Sustainability. Bookmark the permalink.